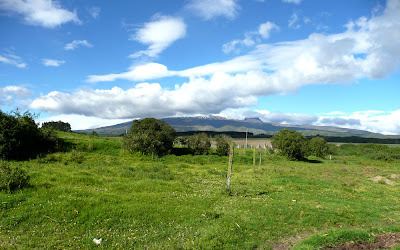 On the tenth day of our visit in Ecuador our host Eduardo and his friend Daniel took us to the Hacienda St. Agustin just under the strato volcano Cotopaxi. We took so many photos on this day that I am going to publish this excursion in a few parts. 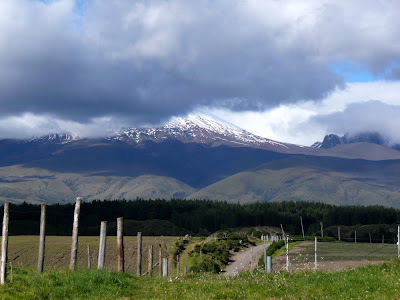 Like many of our excursions in Ecuador the directions our drivers had were not the kind of directions we, as Americans with Mapquest, are use to. The trend was to ask a pedestrian or a service station attendant for help if the going got tough. (Which it usually did.) The trip to the hacienda was one such trip, complicated by the fact that everyone seemed to have rather vague and somewhat conflicting directions. We finally did arrive at the Hacienda, via a very bumpy road off the main highway. We all gleefully piled out of the car to crisp, fresh mountain air. I was immediately transported to my childhood trips snow skiing in the Andes. Indeed, here we were in the Andes, albeit a different area within the vast, continuous range that extends into seven countries within South America. "Church unveiled the painting to an astonished public in New York City in 1859. The painting's frame had drawn curtains fitted to it, creating the illusion of a view out a window. The audience sat on benches to view the piece and Church strategically darkened the room, but spotlighted the landscape painting. Church also brought plants from a past trip to South America to heighten the viewers' experience. The public were charged admission and provided with opera glasses to examine the painting's details. The work was an instant success. 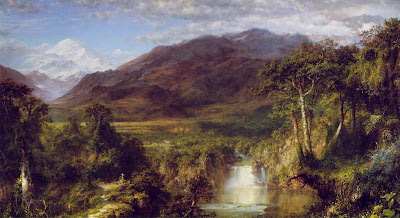 Church eventually sold it for $10,000, at that time the highest price ever paid for a work by a living American artist." 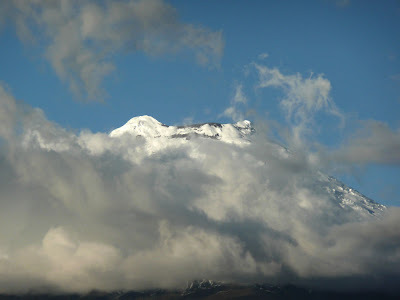 Regrettably, during our visit in the Quito region, Cotopaxi was veiled by clouds whenever we had our cameras ready to photograph the massive giant. All photographs are ©Villa-Spalenka. 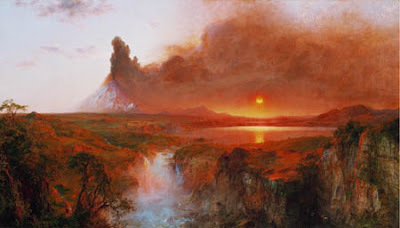 Paintings by Federic Edwin Church are in the public domain.